Kimochis are Japanese inspired educational toys which are designed to help children manage their feelings in a fun and comfortable way. The Japanese word "Kimochi"　きもち （気持ち）is a broad term which covers everything to do with emotions, and broadly translates to feeling or mood. A good feeling is "kimochi ii" 気持ちいい（気持ちいい）and a bad feeling is "kimochi warui" きもちわるい　（気持ち悪い）. 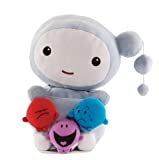 Some of the cute and cuddly characters from the Kimochi team are the Cat, Huggtopus, Cloud and bug, and inside them are the "Kimochis"; small and soft pillows which represent different feelings. The cute and cuddly Kimochi characters all have their own unique personalities and feelings just like any human being, and are designed to assist children in identifying their emotions. 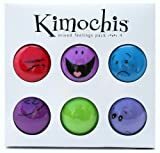 Used by parents and teachers in role play, lessons and plays, the Kimochis help build communication skills, and assist children in getting in touch with their feelings. The Kimochi Huggtopus personality is very friendly, but sometimes crosses the line, and needs to learn about boundaries. The Kimochi Cloud is quite unpredictable and can be very moody. It can turn his head and either show a white happy face or a sad grey face. The Kimochi Bug is very shy caterpillar who tucks away its wings when it is unsure of something, and is afraid of any change. The Kimochi Cat has a very strong personality always gets into trouble. Hence a band aid is provided to help relief emotional and physical wounds. Each character comes with a pouch where the Kimochis/feelings are placed. They are designed to reach any child no matter the cultural background, and not all are gender specific. Furthermore with its own box of soft pillow "feelings", every character represents unique feelings. Additional mixed packs are available with emotions such as being hurt, jealous, angry, sad, brave, silly, loved, happy, shy, grateful, sleepy, embarrassed etc. Other characters are the Kimochi Lovey Dove, Kimochi Clover and Bella Rose. The Lovey Dove has a little "Turtle Dove" baby that comes tucked under her wing. She is sweet and nurturing and is always there to help in difficult situations. Wise and calm, she is a good problem solver and listener. The Clover has a great sense of humor but is a bit absent minded. 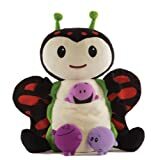 He always means well and comes with Howard, a removable ladybug. The three feelings are: Disappointed, happy and optimistic. All the Kimochi range comes with an instruction booklet, a so called Feel guide, to help parents, teachers, therapists and the like in introducing a wide range of feelings to children through fun lessons and activities. Kimochis were created by award winning producer Nina Rappaport Rowan who won an Oscar for her animation Bunny in 1998. She used her background in animated films to create characters kids can identify themselves with, and teaming up with children's' communication expert Ellen Dodge Kimochis have become important means to opening up dialogue between parents, teachers and kids. For Nina Rowan the horrible Columbine high school incident had a huge impact, and made her question why some children had become lost and self destructive. She dug deeper to find out what was missing in the emotional education of children, and what made kids so disconnected. It was the birth of Kimochis. Today Kimochis are not only being used by parents and teachers, but have also become handy for psychologists, special needs education therapists and social workers. Great Wizzle! I'm big on educational toys. These Kimochis are so cute. I suppose they are great substitute to real pets or useful learning tool to gain necessary responsibility before getting one. Well, they are adorable! I'd never heard of these before - glad I found your page. Wow. This is a great concept for helping kids express their feelings. Very healthy way to do it -- a cuddly friend to be your "voice." They are adorable. I like the Huggtopus best. Lovely story, I knew only part of it.